Published in the South Kent Gazette, 26 March, 1980. Because of the railway the beach Is not visible from the Beach Street area, but before the railway era there was a wide plain of shingle. It was margined on the landside by an irregular frontage, consisting of shipbuilders, and mariners’ houses, intersected with narrow alleys, some blind, and others going through into Seven Star Street, forming a labyrinth which, to anyone but a native, must have been hopelessly bewildering. On the seaward side, the beach was occupied by the Townsend Battery, and some shipbuilding yards, a pilots’ look-out, some houses called “Fisherman’s Row,“ which, a few years earlier, had been busy in the building of ships for the Navy. Extending under Archcliffe were some other residences, a rather notable public-house called the “Mulberry Tree,“ and a rope walk or manufactory. Such was the condition of things prior to 1837. Taking a longer retrospect, four hundred years ago, there was no Beach Street and very little beach. In the year 1581, certain ancient mariners of Dover were examined, and they affirmed that, within their recollection, “there were no banks or shelves of beach to be seen before Dover, but all clear sea between Archcliffe and the Castle." In their opinion, it was the building out of the pier, by John Clark, from Archcliffe Point, that caused the beach to accumulate. About that there can be no doubt, for, as the piers extended, the beach increasedly accumulated, so that, ultimately, the whole tongue of land later occupied by Beach Street, Seven Star Street, Middle Row, Council House Street, Round Tower Street, Clarence Place, and the South Pier, was reclaimed from the sea. That reclamation occupied about two centuries, which was a period of stem conflict between the sea and harbour makers. Time after time, furious tempests from the southwest made breaches in the harbour walls, sweeping the shingle into the dock3 and basins; but, although the sea had ample capacity for doing mischief, it never seemed to have any chance of regaining its lost territory, for the accumulation of beach not only filled up the south-western comer, but continued its deposits along the whole bay, filching from Neptune the whole of the space known as the Pier district, and all the land on which the marine residences as far as East Cliff have been built. Confining our attention, however, to Beach Street we find that the efforts of the sea to reclaim possession were repeated, time are time, with great vigour. During the American War, in 1779, Townsend Battery was built on the site of the old South-Eastern Railway station, but the sea swept it away, so that it had to be re-built in 1793. Dreadful havoc was made from time to time in the shipbuilders’ yards. Later, when the South-Eastern Railway makers had taken possession of the site, a terrific gale washed away their partly constructed work, the had claims on that spot. Thirteen years later, when the attack being a rude sort of notice that Neptune still railway was in full work, the sea made a still more furious attack on the 27th September 1856, with the result that between Archcliffe and Shakespeare Tunnel, fifty yards of the permanent line was washed away. A quaint but powerful little locomotive, one of the first to be employed on the Kent lines, puffs its way towards Shakespeare Cliff tunnel in the early 1840s. At that time and for many years afterwards the track traversed a half-mile-long viaduct laid on the shingle and built of massive baulks of timber which was swept by the sea at high tide. 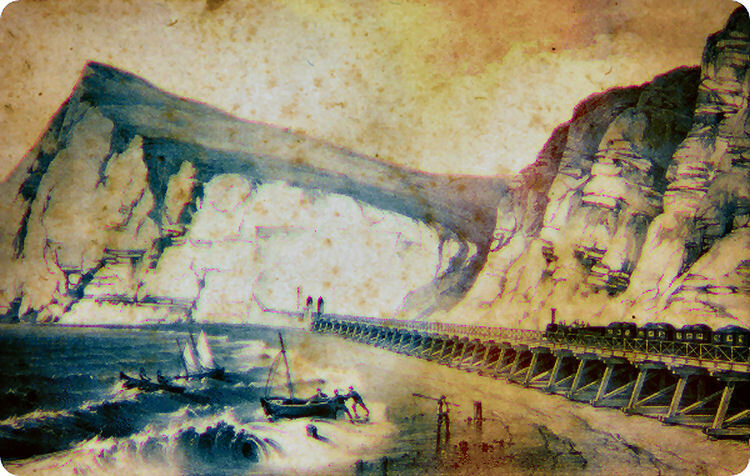 The line to Dover from Folkestone was opened on 7th February 1844. The engineering work involved the celebrated destruction with explosives of one of Dorn's famous white cliffs, the Round Down Cliff, just beyond Shakespeare Cliff. William Cubitt, the engineer, used 18,500lb of gunpowder to blast into the sea a chunk of cliff 300 feet long by 70 feet wide. But the year the line opened ended on a sour note. On 3rd December two labourers engaged on clearing chalk at the Warren finished work at 5 pm and set off to walk home along the line through Abbot’s Cliff tunnel. During their walk they heard the up-train coming and moved over to the down line to let it pass. Unfortunately the noise of the first train drowned the sound of a second on the down line and they were killed. 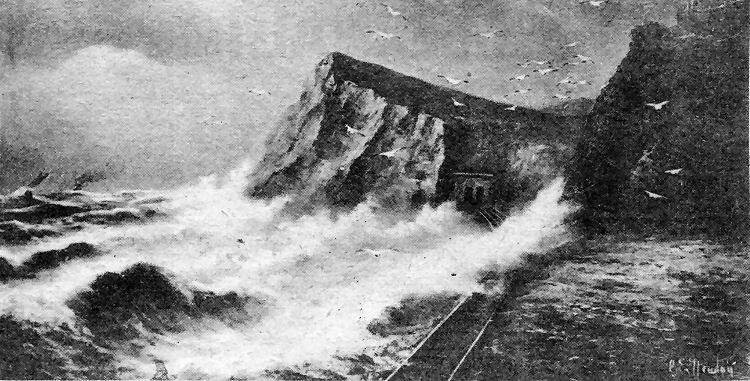 An artist at the turn of the century painted this striking picture of an angry sea, similar to that which once swept away part of the line, battering the trestle-mounted railway track leading to the Shakespeare Cliff tunnels.